Each team's coach will be asked to nominate players based on team's order of finish in all Michigan USSSA fastpitch tournament qualifiers for each 2019 season. Nominated player's guardian will receive an All-State Games invitation email from Michigan USSSA Fastpitch. You may nominate players from other teams but MUST have their parent/guardian email. These nominated players will be the event's All-Tournament Team. **If you have any questions regarding the Michigan USSSA Fastpitch All-State Games or the nomination process, please email bob.wilkerson@usssa.com. The 2nd annual Michigan USSSA Fastpitch All State Games will be held August 3rd, 2019 at Bailey Park, Battle Creek, MI. The All-State Games will showcase players who have been nominated throughout the season at participating All-State Games qualifiers. Players will be nominated for displaying great overall effort and tournament performance throughout the season as well as displaying great sportsmanship. Nominated players must be on a current registered Michigan USSSA roster or live in Michigan. Coaching staff selections will be announced after the State Tournament. If you have someone who you think is worthy of being recommended for the All State Coaching Staff, please send recommendations to bob.wilkerson@usssa.com. 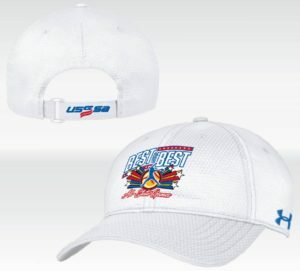 All-State Coaches will receive a ball cap compliments of Michigan USSSA Fastpitch for being nominated, selected and coaching in this event. No player will miss consecutive innings defensively. In the event we have rain, the event will be moved to August 4th, 2019. Catchers bring your own catching gear. All game balls will be provided. All athletes will receive the official 2019 All State t-shirt. Games will be regulation 75 minutes in length. Once time has expired, we will finish the batter. No score will be kept. This event was created to be a fun, non-competitive showcase of players participating with other players from other teams. Poor sportsmanship of any kind will NOT be tolerated. All State Coaches will contact each of their players prior to the event on August 3rd regarding any potential practices, meeting times, etc. Each player will wear their current team uniform for the All-State Games. 2018 Michigan All-State Games ring - 2019 ring similar to the example above. Listed as Michigan All-State player on www.miusssafastpitch.com. All-State Games official t-shirt, logo at the top of this page. CONGRATULATIONS - 2018 ALL-STATE PLAYERS & COACHES. CLICK HERE FOR COMPLETE LISTING.